Swarovski's Rondelle is made of Round Stones combined with metal parts. They are used as a 'spacer' bewteen beads, pearls, etc. 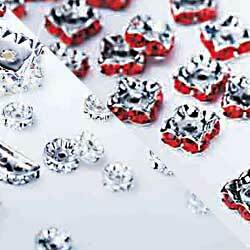 They can also be used to enhance the application of cabochons and/or rivolis. We will collect a list of product items here for your easy reference. They will be sorted by their Codes. Not every rondelle crystal has a name but when they do, we will include it. Click on the code-link for more details of each item.